Public relations experts, who abound, may quickly advise... inform? us that this is no way to address one's public. It is offensive, harsh, has discord, is not advised, ruffles the ego, troubles the peace loving instincts, and so on, and on. However, if it is rot, why not say so? Are we to be so anaesthetic a people that we lurch towards some soporific-looking drowsiness, lest we awake? The implication of the title is in any case not personal, in any individual sense. I used to think of the Gospel, myself, in something of that negative light. Oh, there would have been some element of fearfulness perhaps, as if it had some majesty, and something almost unspeakable; but for all that, it appeared at that time perhaps as the lurk for weak people, strange people, emotional people, oddly and curiously holy (godly ?) people, and at any rate other people; and it appeared altogether such an intrusion, such a way of direction and inconvenience that naturally it was best avoided, and that rather ... quickly. So you see, it has nothing whatever to do with one's IQ. Mine has not changed. It has much to do with drowsiness spiritually, a sort of insulated, isolated, consecrated devotion to i) oneself or ii) the world or iii) one's success or iv) one's way of life and so on: it was this for me then, as it is now for multitudes. For the time I found it, as many find it, just - an alien phenomenon. What however has THAT to do with its truth ? People who make such excuses do not excuse themselves for not facing the truth. The truth WILL be faced, whether one chooses to face it or not; that is the nature of truth. It IS! Incidentally, that is close to the name God gives for Himself to Moses, and Christ likewise to Himself to us in the New Testament (John 8:58, Exodus 3:14): "I AM" ! I love that name. It is so uncontrived, so lacking in salesmanship, like oak furniture; it has grandeur and simplicity, it is strong, right and serviceable, but not changing in order to be so. It just is. As Keil and Delitzsch point out in their Old Testament Commentaries, names formed with the imperfect tense, as here, show that the quality in view is constantly manifested, is continually deployed. Here it is the divine being, the life which is manifested, and in this glorious being, life is without constraint, containment or intervention. What it is, it is, and it goes on being it, not in the abstract, but in a constant deployment which exhibits the character, here not formed but formal, not intruded into, but as it were, extrusive. It is independent in existence, in action and in life. is there any POSSIBILITY of what? Why this: of having the perspective which not only is helpful pragmatically, but far more, is past all investigation, accords with all reality - while capable equally of withstanding perfectly any investigation - that which is correct. This, it incorporates all aspects, omits nothing and sees things as they are in the unique, transcendent mind of the Creator who needs neither hypothesis nor instruction in anything. He believed in the creative flair of man and that the human spirit could reliably intuit, guess, invade, construe and counsel concerning what really is there, and (ibid.) holding with determination that there is a god, he dismissed any view of God playing dice with the universe (London Observer, April 15, 1964). An abdication of quality control would of course be a denial of oneself, if one were all-powerful, valuing quality - a denial of the nature that was one's own (cf. SMR pp. 32-35). Further, to learn from one's own universe would deny its absolute creation, though this last consideration is not to be attributed to Einstein. Indeed, it leads inexorably to conclusions. Thus an objective, intuitable, realisable, comprehendable universe is posited by this scientist, but there is no `proof' that he can supply. On the other hand, since Einstein did not present evidentially-held communication relative to the God of the universe, he held, as has been shown, not only no way to base his `feeling' for the view posited: he really was excluded from it, logically speaking. Further, as we have seen, there has to be an absolute viewpoint for absolute knowledge to be possible*1. (Einstein would not deny the existence of this viewpoint.) Yet it must not only exist but be accessible as a station for view and review. An uncommunicative God is not psychoanalysable (cf. Chapters 4, Section 1, and 8 Section 1 infra, and pp. 30 ff., 46 ff., 88 ff. supra). This being so, without communication express and explicit from God, there is no base. There is unanswerable thrust towards Him, on penalty of contradiction of oneself, one's reason and one's evidence; but without Him, the positive realities await the transcending of the minimal with the actual. Third, if we being limited, cannot know fully the mind of another, how then would we aspire to predict, pronounce, propositionalise, assess, convey, construe and communicate what God thinks in His heart (the attitudes, in this case, the purposes, programs or penchants, the atmosphere, the relationships at the personal level and so on...)! Or how would we substitute `meekly' for His infinite understanding of all His creation, in our so limited declarations, intimations and thoughts. An `inverted commas' revelation is needed to communicate from this personal infinitude to our finitude. God is, and must be known; even to know that He must be known, He must be known. Oh yes, you can show the NECESSITY, as we have done in The Shadow of a Mighty Rock, that He must be; and that He has spoken - but as to WHAT He has said, until you READ it, you know not what the highest and final assessment of all things is. Now you may of course read it, and yet know nothing. How? In this, that you do not BELIEVE IT! It matters not at all that it is PROVEN that it is true; if you do not BELIEVE it, then as with anything else you do not believe, you are not in possession of this thing, but alienated from it, divorced, it does not inhere in you, is not one of your operating facts, features, or functional contributors. then we can at once see the danger humans may have. This synthetic unity is susceptible to INFLUENCE, from within, from without. It can be damaged, deranged, polluted, infected, distorted and so forth. Its springs can be poisoned, its vision vitiated, its desires contorted, twisted, sick, unrealistic and ruinous, and all this without it being realised; for when the unity is wrong, the results are wrong, and the unity may be more or less unaware of the condition with which it is afflicted. Sick personalities are not automatically self-analysing! (hence the highly dubious value of psycho-analysis - dubious because, to put it in a symptom, many psychiatrists commit suicide, or more formally, personalities without truth are not good assessors, and truth is not an automatic result of ANY human education as such). the underlying reality of which the personality is the expression. the identity which was created. It is what it HAS BEEN MADE. THAT is the first and most obvious difference between it and God! He IS WHAT HE IS! The person then, is the goal. THIS is what matters most. For man, the design specifications thus matter much, for even the person may be from birth imbued physically or mentally or spiritually with poison, with needless limitations of decline, as well as with necessary limitations which belong to all that is MADE, or in this case, CREATED. Still, we move nearer in terms of the design basis, to the truth. GOD comprises three persons. As shown in Part IV of Chapter 7 in The Shadow of a Mighty Rock, they do not ADD UP to Him! He is not an integration of 3, since He always was, and hence there were not three in independence which had to be made one in synthesis. You simply have to stop thinking in terms of the processive and the progressive when you think of God; for that is the childish matter of the temporal, when we are here confronted by the Eternal. Hence in all details, we must preserve this necessary perspective. As to BEING: ONE. As to PERSONS: three. As to NATURE: ONE. As to individuality, THREE. The three with the identical nature, character, yet have a differentiation of function. All this was dealt with rather well by the Cappodocian doctors, early in Church history, but it is well to become aware in our own time. There is in infinite intimacy of the three, a dynamic without interstices, so that there is not SPACE or THING or OBJECT beyond them, but rather their very beings and inter-relationships all are without confinement, condition or conduit. From this arise our CREATED and IMAGE-of-GOD related families, loves and so on. That is the basis of them all, this Creator. As created, they relate; but also as created, they lack the supra-temporal, supernatural eternity which always was, and from which 'time', our time, came as we know it, and experience it. Indeed, it is precisely because of this, together with the fact that we are made BY and FOR the Eternal God, that there is such glamour and resurgence of interest in so many drug related feelings of unity and depth and so on: there is the natural impetus even in deformed and defiled personalities to experience or know ... God. Mischievous manipulated substitutions attest the form, through ... even disease. Now let us look at an illustration which I have often used, and we shall not extract this, as indented below. It is GOD who is the only sound quest. His SON is the only verified way. His SALVATION is the only offer on record to man, to give righteousness. His CROSS is still the only remedy which covers man's sin, showing that God is just and we are not - but that He has a way to make up the difference. Heaven has greater values (I Peter 3:18, II Corinthians 5:19-21) and better strength (I Corinthians 1:20-25). But that way takes repentance (Luke 13:1-3). How CAN you meet God's specifications in your own life if you have not even studied them. God-given FAITH in Jesus Christ as Saviour and Lord enables you freely to RECEIVE the GIFT of ETERNAL LIFE (Ephesians 2:8, Romans 5:15): just as a wire admits electricity, surging from its generating equipment into your house. YOU do not create the electricity. It is like a lake on a mist-shrouded hill, with a waterfall of sparkling, thirst-quenching blue waters leading you by its stream, to the top. The lake at the summit? it is like the Father who sent His own Son. 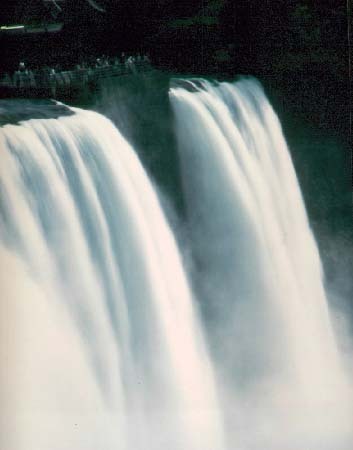 You will note that lake and waterfall are both water; and without that, your thirst would be unquenched. Christ declared: Before Abraham was, I am (John 8:58; 5:19-23; cf. Isaiah 48:16, Zechariah 2:8, 3:9, Psalm 45, I John 1:1-4, 4:9-10, Micah 5:1-3, ). Jesus said: Whoever drinks of the water that I shall give him will never thirst! But the water .. will become in him a fountain of water springing up into everlasting life (John 4:14). Note the vitality. He also stated: I am the way, the truth and the life, no man comes to the Father except by Me (John 14:6). Then, for our picture, the stream rushing down, spills over a rocky precipice to fall where hydro-electric works are built. That jagged place is like Christ's Cross. Thence, pylons convey the power to needs of the city: like faithful people passing on the message of God's love and salvation (II Timothy 2:2). True, in some houses there is no electric connection. That is like unbelief. Some prefer candles (Romans 6:23, John 8:12, 3:19-21). They show less dirt, but also less beauty. Perhaps invisible to you, there is a highway: it is called the Highway of Holiness. No don't wince! Holiness is wholesomeness and real devotion to God your Maker, in Christ the Saviour. With mind undivided, it has the gift of peace. On this (Isaiah 35:8), we read, that "the travellers, though they be fools, will not go astray." Let us consider this. When you are in love, it is not the experience of love which concerns you, but ITS OBJECT. It is not whether you speak in poems (which may be poor), or tongues of glory, or not. It is not tongues but truth that matters! It is the OTHER PERSON whom you love. It is whether you are at peace with your loved one - and near. God's people love Him, and thus love His sacrificed but risen Son (John 8:42, Ephesians 2:12-22), and His words; and so plan to keep these (John 14:21-23, 8:31). If you don't know His words, you can hardly keep or follow them. God's people are set on a highway. Are you ? This gives you the illustration. The movement of God to express is in the Person of His Son - not of course biological Son in eternity, since GOD is a Spirit (John 4:14); but the Eternal Son is the eternal EXPRESSION (WORD, John 1:1 - there being only one God, as is demonstrable - SMR Ch.1,3 - as Biblically affirmed very often, as in Isaiah 41-45 - this is the One with GOD, and who IS GOD, as in Colossians 2:9, 1:19-23, John 8:58, 5:19-23). The FACT of human sons indicates the REALITY of transmission in our terms, of being, nature with tenderness towards company and mutuality, with continuity, and so on. The REFLECTION of God, in whose image we are, is that HE has the EVERLASTING SON, to whom, in due course, He gave biological expression in the person of the ONE formed by direct supernatural intervention (Luke 1:35) in a human format, through the person of Mary. The result was this: the ETERNAL SON, WORD of God, the living person became flesh, took for His current or contemporary format, that of man, while He went as sent to redeem those who would come to Him. It is most important to realise this, as the passage in Colossians 1 just noted, attests, that it was to ALL that He came - GOD SO LOVED THE WORLD*2; but it was not a world of system. It was PEOPLE IN IT, for whom He came. The corrupted people have a corrupted system, and no system, however fine, ever works or could work or even should work, because they leave out God and the Kingdom of Heaven (see Ch.2 in The Kingdom of Heaven; and The Shadow of a Mighty Rock, pp. 623-631A). The way is narrow, like that waterfall from the lake. It is beautiful, clean and serene; it is real; it IS. It must be negotiated; but only God is able to do that. YOU must repent of sin, submit yourself to Him, call on His name and accept Him, believing in the PERSON of HIS SON, because THAT is the PERSON of the TRINITY who is sent (Psalm, 40, I John 4:9, Zechariah 2:8-9, Isaiah 48:16). There is no other pathway to glory. Forget the trinity? You might as well forget your visa on an international tour. It is HE who is the entrance - John 10:9. Without Him, your flight does not even leave. You sit meditating (transcendental meditation? ) on the tarmac. But in this, there is no lift. Feelings do not lift aircraft. You see, we are dealing with reality, with what is, not with what it seems to be, should be, might be, could be. We deal with the things that are. The Father SENT the SON. Without the Father, there is no sending. The Son likewise leads you TO the Father (John 14:6). Indeed, ALL THINGS ARE DELIVERED TO THE SON FROM THE FATHER (Matthew 11:27, cf. John 16:15), and they are His. You cannot even KNOW the SON by yourself. NO MAN knows the SON except the Father, He knows Him. No man knows the FATHER except the SON reveals Him (cf. Matthew 16:17) - CHOOSES to reveal Him. Thus Father and Son are not penetrable like a recess in Tibet. They demonstrate, take the initiative. The Holy Spirit (John 14:15-18) will comfort, that is strengthen, be present in and for, provide and present Jesus Christ to the inner person of man - believing man. So there is this glorious interplay, if one might almost reverently use the term, to exhibit one aspect. Rather let us say, there is a mutual mediation and inter-relation which is inseparable. Christ has come forth from the Father (John 16:28, 30), yes, like a waterfall from the lake; but more than this, He has come CLOTHED IN OUR OWN FORM AND FORMAT, displaying in terms most natural to our hearts, if only they look and see, what He has to give and to show and to offer and to be for us. You TAKE OFF on your flight when you ARE TAKEN. For that, you need to be ON the flight, and the "aircraft" is Christ. But you may say: How do I get on this flight? I CANNOT just grab Him, my eyes are not in my control to see, and where would I put my feet to "board" for the flight? You do not want Christ, the Son, the Word, then? Why worry, you have what you want! You DO want Him. Simple: Tell Him so - and tell Him that you repent of your sins, that you are without significance except by His mercy, that you deserve destruction according to strict justice for which only perfection is even relevant (and incidentally, God IS perfect, and what is not does not cohere with Him in heaven: indeed it would no longer be able to BE heaven with THAT in it!). TELL HIM! Say to Him, "Take away all iniquity, and receive (me) graciously" - that is how Hosea 14:2 has it. You DO NOT BELIEVE this? very well, again, why worry! You do not believe it, so what are you missing - to your mind. Certainly you are wrong, since it is demonstrable, but if you do not believe it, why let it concern you! You will suffer for your contumacy, obstinacy (I Samuel 15:23 gives a good picture of the pure folly of not knowing God): but since it is not in your heart to even believe it, why are you concerned? You DO then believe it? Fine. No further problems. Go to HIM, as noted above, to the SECOND and the SENT PERSON of the TRINITY who came for you, and is ever ready to succour and receive you. Tell Him more, that you accept that HE is God, that it is to HIM you must come, that HE alone leads to the Father, and in COMING, then GO with Him TO the Father, who is then not only as to form and body, but in spirit and in truth YOUR FATHER, and accept His redemption through HIS Son, in which He DIED for you, so that your SINS are now BORNE by HIM, since He is willing and able to bear those of all who come, and could take unlimited numbers, being infinite. His death is sufficient cover for any and for all; but it is deployed ONLY for those who coming, avail themselves of the pardon so compressed in it, so available, so devastatingly available - to sin, so wonderfully available, to hope. You come? Alas, there are many who do not because they will not. Let me share with you an experience with quite a large group at a University, and for this we go to our Questions and Answers - The Word that Speaks, No. 7: we shall give it in a little context. It was dealing with the question of Good Government, and we shall allow the illustration to appear as you read below. The indent is the quotation from the work just noted. A: There needs to be an awareness of talent, and positive desire and interest in its exercise. You need to be a talent scout, and to take real pleasure in seeing talent and task well-matched, goodwill and good graces in excellent function, and a complete abortion of the detestable and selfish desire for 'survival' (in your own place, as in the places of all leaders below you, if you are a Minister of Government). If you despise the rat-race, the simple plan is to opt out and to walk in moral grace, seeking good - not survival. A person who trusts in Christ has no need of 'survival'; the cross is the OPPOSITE ambition. Resurrection is quite adequate. Goodness meanwhile is an indispensable quality. Indeed, service at sacrifice is a real thing which has sometimes a bad name because so many hypocrites find it easier to mouth than to put into action. This does not alter the reality, only illustrates the farce of Satan who has no heart for the truth. Q: What about freedom in this moral government of yours? A: There MUST be freedom. That is why, at the University of Adelaide, we were advertising often and extensively as The Truth and Life Club Inc., so that any who felt able should overthrow our demonstration that the Bible is the only authorised, divine word from God Almighty to the human race. It involved the points that there is God Almighty, that He HAS spoken to the race, that THIS BIBLE is precisely what He said, and is His word. Since the GOSPEL is IN that word, and it portrays JESUS CHRIST, LORD AND SAVIOUR, these things followed. Advisedly, we did not (and if we could, would not) FORCE anyone to accept our challenge. It is enough that one group fled after the first meeting, one of them returned, failed to disturb the proof of the Bible, said he would return, never did so, and they then talked about it on the Net to which at that time, I had no access. Indeed, it was years before I took up a personal computer and proceeded as now. As years of challenge passed, at the University campus, however, before that time, some came from time to time, but the truth of the Bible position was never endangered. In the meantime, we asked such people if they would like to write their answers; none came; we asked later, when I took to the Net, if they would like to confront us there, no answer. But it is GOOD that they had freedom to meet us if they would. Our point of course was this: IF anyone can NOT overthrow the PROOF that the Bible is the word of God, and all this shows, then it is MORALLY WRONG to attack it anywhere in the University, since the answer is there. ANYONE, professor, student, could come. Comically, some highly articulate people began to make excuse, saying they could not match us with words - that leading to our other offers of writing and so on. The fact is, as we have shown, and I have found over many decades of all this sort of thing, NO ONE has an answer to this. The BIBLE IS THE TRUTH. Laughter, lampoons, flames - inquisitorial or modern-day psychic binges, flights and fiascos do nothing but show the emptiness of the reason bin of all opposition. Now back to government. For all that, even if I had the political party in power, and were its leader, I still would not FORCE any persons to believe*2A (or really, to pretend to believe), WHETHER they thought they could answer or not. The REASON for the faith is not the faith. If you do not have faith, you lack the most essential thing; for without it, you and God are apart. Since He made you, and you are not self-sufficient, this is a most unhappy state of things. It is in one sense, a form of madness, spiritual madness as the Bible puts it; but this is no REASON to use any form of force. (See SMR pp. 65-72, 1186A ff. ). This of course shows up one important focus. People in general do not really WANT*3 the truth. THEY are and THE TRUTH IS*1, and there is a strong move to keep it that way. The truth is fine if IT SERVES. For what ? For the purposes of the personality concerned. Where do these come from ? From itself. What is it ? Without the God to whom it belongs. What does it do about this ? Keeps its distance (cf. Ephesians 4:18-19). Where then can it find relief ? By faith. How does it get it? By repentance and coming to the SECOND PERSON, the SON who was SENT for just this. HOW can one come? By the power of the Holy Spirit, the THIRD Person, sent from the Father by the Son, who, on going, said He would not leave them comfortless (company-less, strengthless, without the presence of God). This SPIRIT CONVICTS (John 16:7-11). What is the good of being convicted ? In a law court, it is bad, very bad. True, but where it is THE TRUTH (and the Spirit of God is also called the SPIRIT OF TRUTH) which, who convicts, then that is fine, just fine. Why ? Because then you find the truth, and the truth finds you - or this is at last along the way to becoming an occurrence. May it cease? Of course. You could grieve the Spirit. That is terrible? Yes, it is. But IF YOU COME, THE SON UNDERTAKES NOT to cast you out (John 6:37). So come. You do not want to? Again, why worry! You do not believe it, as before. But you DO want to, but cannot? Nonsense. If you want to come, come. It is not hard to fall down before the Lord Jesus Christ as noted. IMPOSSIBLE! you retort. True, IF you do not believe. But if you do, then it is impossible NOT to! It is WHAT YOU BELIEVE and you will OF COURSE act on that. If shares are about to fall to nothing, and you value your inheritance, and wish to use it, then you sell first... don't you? You may be disposed to argue. I MAY not, you say? No, you may not; but if you VALUE your inheritance and BELIEVE this is about to happen, then you will. Your double-mindedness (singularly unblessed before God - James 1:5-7) will not alter the fact that in that case you do not BELIEVE. A double mind is like double vision: as to sight, you are not there. If you believe, act; if you do not, there you are. You have what you want. I pity your plight then, but not more than that of someone with a fatal cancer - unless there be immediate operation. If the personality refuses, so be it. It is sad; but nowhere near as sad as would be the case if the OPERATION WERE UNAVAILABLE! It IS very available; and it was made so by a grant of the Father so immense and so intense, that to refuse it is folly. Erasmus, the famous Dutch scholar of the reformation, wrote a book, In Praise of Folly, in which he lashed the follies of Rome. I however do not even ironically praise THIS folly, roaming from the religion of truth, from what is, from the truth, from the Person who was sent, who has come, who is available, who does not have to be researched or beseeched out of heaven. No propaganda machine is necessary to seek (vainly in such a case) to INDUCE GOD to sent His Son. He resolved to do so, did so and it is to you that this SON is addressed. Come then! Come... One by one we come, for it is fitting to come to the truth, welcoming in the love of God, miraculously (in the strict sense of the term) provided for in the practical engineering of God, whose love has feet, used hands, and had them both pierced. If, then, God had not spoken, while the world remained as it is, then God would also be insulted by the very thought that He would remain inactive in speech to direct and resolve the problems in His world, leaving in silence the insolence and madness of man, assaulting and offending each one the other. It is not only blasphemy, that is a misuse of the very character of His glory; it would also be a denigration, a travesty and a direct personal offence so to speak or to think. A problem out of the power of God! a problem in the very world which He created, out of His depth, beyond His scope, when He had freely created all things, the whole set of abilities and of circumstances for all created life! It would be like telling a film star that she had no face, or a financier that he had no funds, or a real estate agent that he would not know a house if he saw one! The concept that He would be willing, moreover, to let be such folly and filth, such wilful, wanton pain as we have just seen in Kuwait and with the Kurds, when, having a solution, He did not use it, this would be like telling a social hostess that she couldn't care less if her guests starved! Thus there is not only the metaphysical madness of such assertions, such views, such positions: there is also the moral assault on God which is involved. If, indeed, we his creatures would be amazed at the madness of anyone suggesting such things about us, how much more should we be ashamed even to think such things about God, who gave us the power to think and the knowledge with which to know (cf. Psalm 94:8-11). A solution He has indeed shown; and man, willing to move the blame for undoubtedly high-level immorality and actual agony, often sustained, onto God, wants Him a dumb dog, lying down and snoozing. Thus we, whom He created, are active, we think, we look for solutions, we can feel the horror of so much pain for others... but He, who made our hearts and our feelings and our moral thoughts in the beginning (however we misuse this equipment, yet it is there, in our hearts, however spoiled, leaving its residue at the worst), He does not feel ? God who made the heart, does He not feel? God who made the mouth, does not speak ? God who made the mind, does not think? To ask is to answer. We have elsewhere traced the impossibility ontologically, the frank contradiction in having the all-powerful author of justice and ground of truth needlessly allowing flat and continual contradiction, when merely to apply His power removes the problem by removing the people who make it! Now we dwell on the incredible cheek, the irrational implicit assumptions on which any such notion is built. The solution is available; has been shown from the first, predicted for centuries, performed by Jesus Christ, published, proclaimed and preached for thousands of years*4 concerning this same Jesus Christ, concerning whom no one has been able to show even one sin, and of whom even Muhammad had to admit the righteousness. To suggest that God has not spoken when His word circles the earth, His predictions noticeably control the whole direction and character of history, uniquely and utterly, and His Son went to the pain and anguish of bearing the sins of those who will forsake their own: this is to sustain, reinforce and add to the insults of the Cross, the calumnies of Calvary, the madness of the priests. It is to stand, arrogant and upright, in the presence of love, and call it hate or indifference; it is to look, princely and pure, at one's Creator and call Him dumb; compassionate and sensitive (courtesy of being created by one's Creator) and to call Him heartless... this while all the time, ignoring the solution which He has constructed, the sacrifice which He has made, the pardon which is so needed, but so ignored. What is it like ? It is like prisoners in a prison, cut-throats, immoral and dead in spirit, raging at their victims, buried as a result of their crimes against them. Thus Jesus Christ was made a sin-offering to take the burden, the blight and the bane of sin from all who come by faith to receive Him. But He is not dead, and this insult to the moral nature of God is similar to the studious blindness which also slanders His power, by which His people have for centuries lived, their hearts in His peace and their persons alight with His love and presence. It is therefore one more sin, that God is so `sentenced', as C.S. Lewis phrases it, God in the Dock, at the hands of man, His judges. But let us add this: He is being `sentenced' by those sinners to whom He is offering pardon, who are meanwhile slandering His sacrifice and sentencing themselves. In their hearts, truth is contaminated twice: once by sin, and then by sneering at its solution! For all this, the Bible has provided. It is unwise and indeed the utmost in arrogant presumption if derivative man, with unmoored mind, man who does not accept the specific, identified and rationally necessary revelation of God, comes to pontificate on `truth', on the reality of things. Will a conditioned or limited man, reacting and being able to do only what has been given him to do, erect himself as a founder of truth, a source of criticism of the God who made his little mind ? Will a cog discuss the design with the designer ? Will a man without the revelation of God, tell Him what it would be ? Will man show God His own mind! As to the LOVE of God, see Love that Passes Knowledge, Ch. 4 in The Kingdom of Heaven... Also consult, Predestination and Freewill, Section III, up to Foreknowledge, and in The Shadow of a Mighty Rock (SMR), Appendix B. As to the GRACE of God, see SMR pp. 520-432, 570-578, 582-594, 611-623 and 1037-1088H, the end of Ch.10. As to the KINGDOM of heaven, see The Kingdom of Heaven... Ch.2. All these thing are interwoven, like a tapestry of exceeding beauty, unutterable distinction and of a uniqueness which is literally divine. Force is an irrelevance in matters of faith. Moslem approaches almost enslaved Europe in the 8th century, but it was delivered at the time of the Battle of Tours. It is one of the reasons why such religion cannot be accepted, another being its lack of verification and the presence of anti-verification (cf. SMR pp. 50ff., 65ff., 829ff., 978ff.). Thus Surah IX.27 also has this: ``Fight against such of those to whom the scriptures were given as believe neither in God nor the last Day ... and do not embrace the true faith, until they pay tribute out of hand and are utterly subdued.'' Force however is merely an abortion of truth when it is made a criterion. To bring retribution is one thing; to imagine that subjection by force to a 'faith' is relevant to truth is to forget what man is: an evaluating being. What distorts humanity in the name of divinity is neither humane nor divine. See also Koran text in Divine Agenda Ch. 6. See also, More Marvels ... Ch. 4. Force is equally devastating to such religions as that of Hitler (his absolute was in fact a mystic haze and craze, in some kind of association, it seems with Rosenberg), of Communism, and modern variants such as al Qaeda, which is a horn of Islam; but it applies no less to the more subtle efforts of any ostensibly democratic States, which use people to annul freedom of speech, of a rational and well-researched kind, for this is just one more FORCE. If this puts people in prison or annuls posts at Universities or fines: then it is in the same direction, enforced spiritual subservience by exclusion and indirection both: an errant substitute for faith, masquerading in this case as secular. What students do not get, their teachers may not give. It is an iron triangle: force, exclusion, deprivation. It is sad. Thus so many of these students will look forward to the everlasting darkness of gloom, where reality has been countermanded by their wills, and reality is NOT available at their desire. Excuses, excuses, excuses! They are like the people who were invited to the King's Feast for the Marriage of His Son (Matthew 22:1-4). Some were pre-occupied with a new wife, a new land purchase ... but not occupied with that which was right and due and required. Whether it be rational or volitional or cultural or historical, whether psychical or emotional: there is no valid excuse, but there are many words. Neither reason nor culture nor emotion nor will has any sound ground to offer; only the vexatious contumacy of alien desire. Nothing logical so much as stands, as shown in SMR Chs.1,3,10 and in That Magnificent Rock so often. Reality countermanded by will is not countermanded; it is merely denied, and where denied it can crush without apparent feeling, though in fact, the system which is then the steam-roller, having been opted for, and this without its Maker, it can seem that way (cf. Psalm 1:4-5). Like the chaff blown away are the wicked, and what more wicked than this, that the invitation of the King of Eternity is given in time, short, breath-drawing time, an asinine rejection, as if the passing wave of a moment, were worth the ocean! Many like jet-setters seem to rush to their doom as if there is scarcely time to reach it, before, before ... But it will be there. The flight in this short life is so fast. The time is so short, to reach an eternity emptied of all except judgment, it is quite fast for so short a time as that in which we draw breath on this earth. There is not the slightest danger of missing this, on that way and walk and procedure and ground. What is vapid does not stand; and what is rested on, being not there, gives no support. The bottomless pit is what it says, a way of life without support, ground or meaning, that goes down, descending to ever more apt and desolate depths that are grounded on ... nothing. Paul Davies' metaphysical theories must be given credit for having formulated this part, from the physical side, so well, yet alas, so blindly! However this, his nothing is not what he imagined (That Magnificent Rock, Ch.7), this efficient nullity that does so well without anything to it ; and alas, it is not merely physical, but spiritual; and is not a genesis, a contradiction in terms, but a destiny; and as to that, not its totality, but its heart. His 'nothing', as illusion, should be tagged, not trusted in. There will be enough of it before the judgment seat of God, where it consists not least in the no-basement to the pit ( Matthew 22:13). It is this which the Bible teaches, the Book which changes not over thousands of years, while physics makes its bow to the 'inevitable' almost every year, a mutability as ephemeral in its ideas as the butterfly. God? He says it, and it endures (cf. Matthew 24:35); and then endures.... Nor is it surprising that He should know so much better! Nor is it wise, in treating His word, to disregard it. It does not change. THIS is the analysis of God, not man, for all who disregard His infinite wisdom and counsel and might, as a Person: THE FOOL HAS SAID IN HIS HEART, THERE IS NO GOD (Psalm 14:1, 53:1), and the noteworthy point here is this: The word 'fool' in that context means - empty person! God in the Bible is the Almighty, is Spirit, is the Creator and Purveyor of all, and the divergence between Him and .... nothing, is infinite. That is some error, to make: an infinite error. The results of it likewise have no end. The rebuff? It is from God - not man, from His word, not that of man: like the result. See SMR Appendix C and D, Christ the Wisdom and the Power of God Ch. 8, Repent or Perish Ch. 2, The Magnificence of the Messiah for example.